Wrigley Roster Jenga: If I Can't Play With My Food, Can I At Least Display It? If I Can't Play With My Food, Can I At Least Display It? Retail exclusives are far from new in our hobby. For many years now, certain insert sets and parallel colors have been divided up among in certain big box retail locations; you had your Target reds, your Walmart blues, etc. Furthermore, products like the snowy Holiday set were made available only at Wally World and several well-loved lines (like Finest or just about any flashy, high-end stuff) are only found in hobby shops. Like I said, having certain things only available to the public in certain locations is a concept that is far from new. Reynolds Wrap aluminum foil has long been a staple of kitchens across America ("trusted since 1947," after all) and, for the past several seasons, have sponsored the rain tarp at Wrigley Field. For the record, I think that this is one of the most ingenious and "pun-eriffic" sponsorships in the history of professional sports. What company would make a better sponsor for the protective covering of the Wrigley infield, keeping it safe from moisture and other, outside elements. Plus, tarps are typically a deep blue, the same color sported by the ubiquitous Reynolds Wrap box. Apparently, this name change came about as the result of a bet between Rizzo and the Reynolds Wrap people, which dictated that if the Cubs should win the World Series in 2016, the company would have to change the name of their marquee product to honor the prodigious slugger. Well, as Rizz says in the video above, "we all know how THAT ended." Nope - this is a real deal and you better believe that I stopped by the neighborhood Jewel to pick one of these bad boys up. 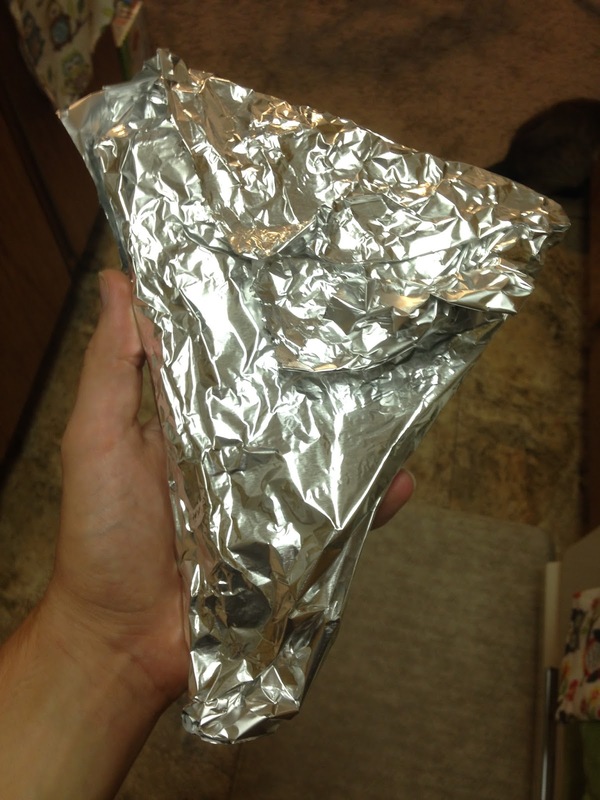 First of all, my wife and I have issues with cooking proper portions, so aluminum foil is absolutely always useful in our borderline gluttonous household. Second of all, though it may be gimmicky and an obvious ploy to get Cubs fans to shell out money for their product, but it certainly makes for an interesting, offbeat addition to my Chicago Cubs shrine. Now, it's natural that the Reynolds Wrap people would choose Anthony Rizzo to make this bet with; after all, the middle of the order presence has been part of the nucleus of the Cubs powerhouse since 2012 and his acquisition has since been seen as one of the turning points of the then-listless franchise. All of that important detail aside, there's an even bigger reason why Reynolds Wrap should choose Rizzo to emblazon on their aluminum foil - he gets them a lot of extra exposure. You see, Anthony Rizzo has a history of making fantastic catches at the tarp. The two above are highlight reel worthy themselves, with the former even earning it's own bobblehead tribute via stadium giveaway. That said, I know of at least one or two more that I could not readily find on YouTube. In summation, as Rizzo sees it, the Reynolds Wrap tarp is as normal a part of Wrigley Field as first base or the batter's box. If you live in Chicago or the surrounding suburbs, you can pick up your own box of Rizzo Wrap from your nearest Jewel-Osco all throughout the summer, while supplies last. Although, it's too bad that this product wasn't available during the winter months - maybe if the Cubs had safely wrapped their bats in Rizzo Wrap during the offseason, the offense would be a little more fresh. Zing! *Sigh* Story of the season, boys. ..."Zorilla Crunch!" 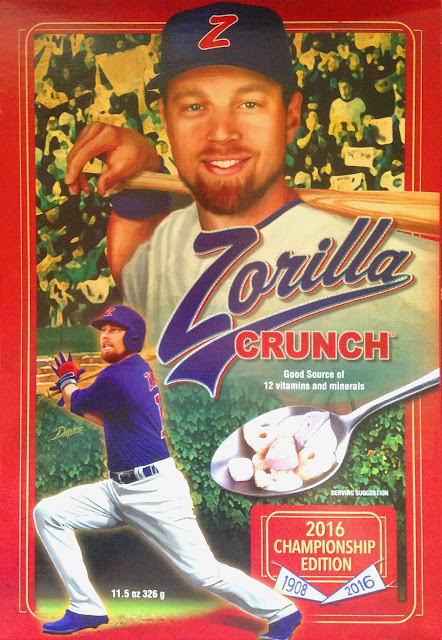 Like Ben Zobrist, this breakfast cereal is an underrated and versatile part of the Chicago sports fan's healthy, balanced breakfast. Hopefully, seeing as the man has been injured for most of 2017, Zobrist will make use of his "good source of 12 vitamins and minerals" to maintain proper nutrition and nurse himself back to health. 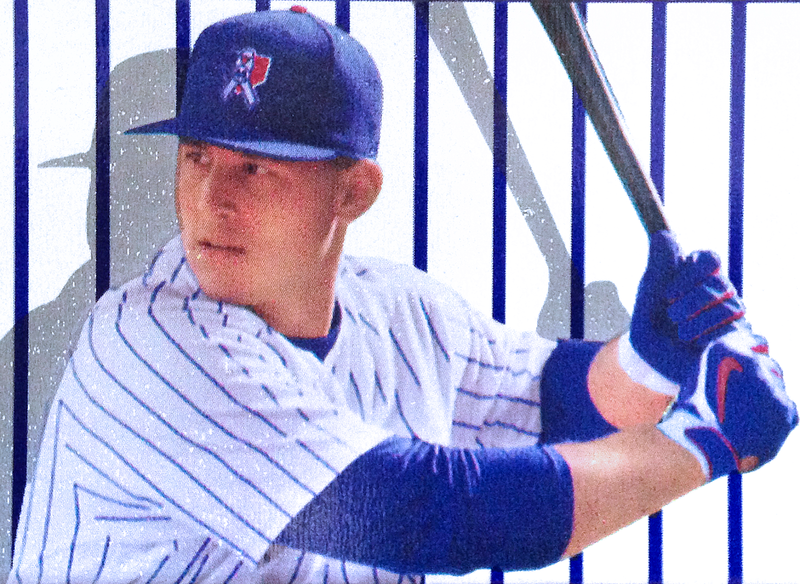 Anthony Rizzo is well on his way to being an all-time franchise great, Grandpa Rossy is a baseball folk hero, and Ben Zobrist took home the MVP honors for the Cubs' first World Series title in 108 years. All in all, not a bad selection of players to have represent your team on kitchen tables as the sun rises each morning. On the other hand, maybe the decision to stick with a mostly uniform design is actually a plus for the OCD crowd. 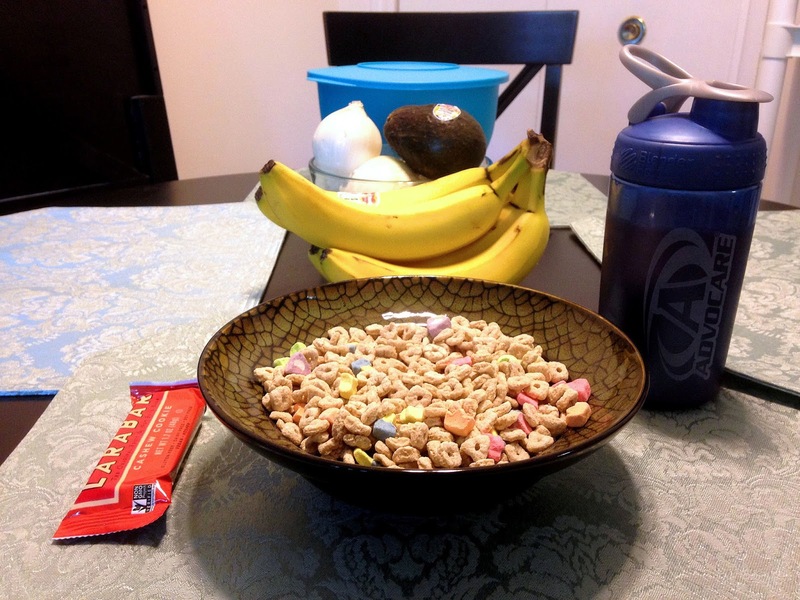 As for the inside of the box, the cereal contained within is a knock-off brand of Lucky Charms. I'm not really sure what the connection between "Zorilla" and Lucky Charms is... maybe it was the only kind of cereal lying around the warehouse at the time? At any rate, any cereal with marshmallows is almost certainly a winner, so I'll let this one slide. Moving on, we've covered the front of and the inside of the box - what do we have on the back? Any kid will tell you that the rear panel is the most interesting panel of a cereal box. Any self-respecting cereal has a puzzle, word scramble, story, coloring panel, etc. on the back to keep the attention of toasted oat-spooning children (eyes on the box means eyes on the brand, y'know). 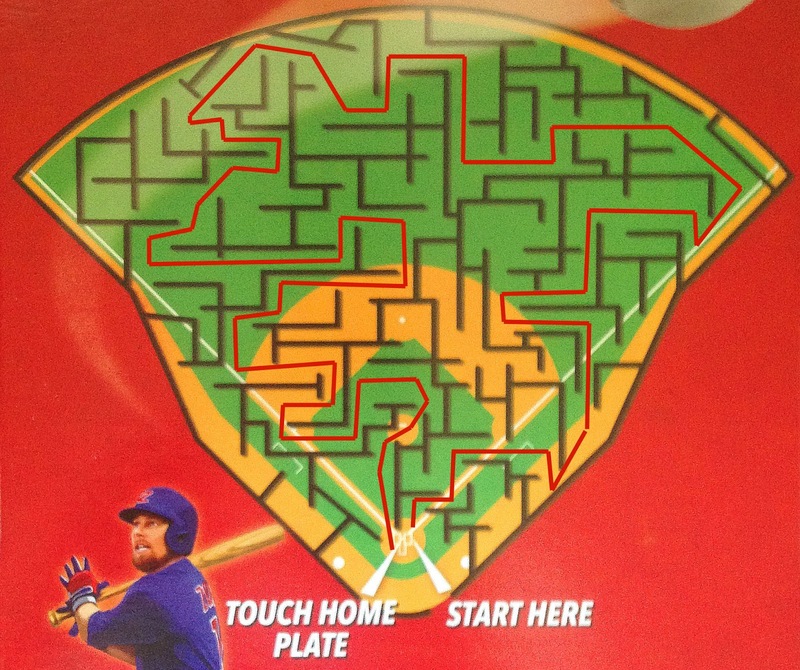 This brand is no exception, as the minds behind this Cubs promotional item made sure to include an engaging maze for Windy City kids to work through while they consume their Lucky Char.... I mean "Zorilla Crunch." As I've mentioned in both of my posts about "RizzO's" and my musing on "Grandpa Rossy Flakes" (which really should have been knock-off raisin bran, if you think about it) what these specially-branded boxes of cereal are missing is the inclusion of an oddball baseball card - the artwork just screams for the unlicensed baseball card treatment. C'mon - a set of these just NEEDS to be produced, right? 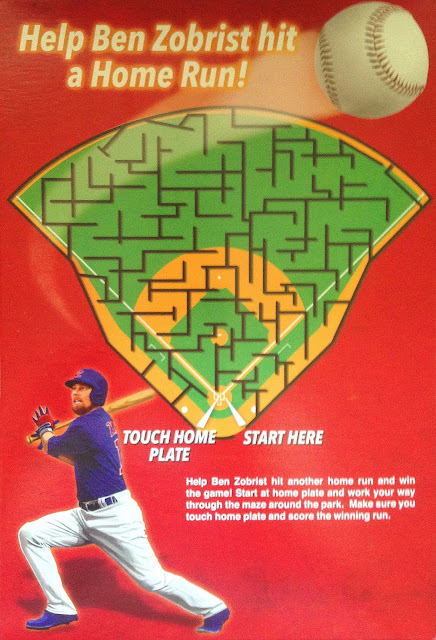 Unfortunately, the closest we come to such a glorious thing on or in any of these boxes is the Ben Zobrist bio found on one of the side panels, where you get some of the now-injured veteran's vitals, plus career highlights and achievements. Personally, I always forget that Zobrist is a back-to-back World Series champ; surely his brief stint on the Royals will go down in the annals of short-term stop history. Plus, there's also Ben's Twitter handle, in case you have your smart phone out at the breakfast table (if so, rude) and the solution to the maze we covered on the back panel. However, I've taken the liberty of blurring it out here - no spoilers! On the opposite side of the vitals, we have nutrition facts, as required by the Food and Drug Administration. Just underneath that and the ingredient list, we have the markings of Jewel-Osco and PLB Sports, the distributor for the full line of 2016 Championship Edition cereals. In addition, the Pennsylvania-based, food marketing company is behind an assortment of other athlete-branded and endorsed lines of food throughout the country. Their resume includes work with not only Major League Baseball, but also the NFL, NBA, and NHL, as well. 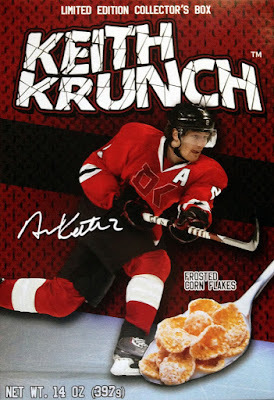 PLB and Jewel got me to bite (figuratively and literally) on yet another box of cereal, this past winter; though, Keith Krunch clearly did not turn out to be "the breakfast of champions" for the Blackhawks. 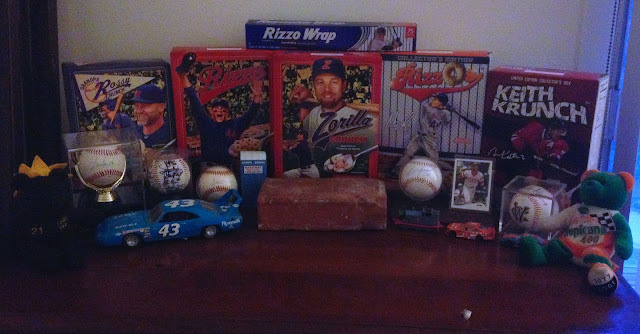 Sharing real estate with my new Rizzo Wrap, Zorilla Crunch and all of the rest of my branded cereal boxes are my autographed baseball collection, a brick from the original Wrigley Field bleachers a few NASCAR die-casts, and a pair of stuffed bears. I'm sure all of these items will appear at some point on the blog in the future for further explanation and dissection; but, for now, they're too busy battling for coveted space. Speaking of which, sadly, I had to boot my box of "Slammin' Sammy's Frosted Flakes" until I can get a shelf set up in my new office/hobby hidy hole. Seeing as the wife and I just moved about a week ago, I've got a long way to go in the unpacking and setting up process before that becomes a priority. See? This stuff isn't just fun, it's functional too! Thank you to the Chicago Cubs, Jewel-Osco, PLB Sports, The Anthony Rizzo Foundation, Anthony Rizzo himself, Reynolds Wrap, and Ben Zobrist for helping me figure out two of my three meals on this fine summer day. For now though, I hope this is the end of this retail exclusive, food-based, Chicago sports collectible explosion. Don't get me wrong, it gives me great pleasure to sit back and admire my Rizzo, Rossy, Zobrist, and Keith boxes, as part of my suddenly exploding food tie-in collection. However, storage and display space are becoming an issue... they take up a little more space than the 2.5" x 3.5" cardboard rectangles that I normally focus on. Heck, poor ol' Sammy already got booted due to lack of space and I don't think my wife would be too happy if I started replacing the family photos with another round of cereal boxes. At any rate, it's time to "Rizzo Wrap" this post up. Before I go, I have to ask, does anyone else out there on the blogosphere collect these sort of non-card oddities? Wheaties boxes have a notably strong market, that's for sure; but has your team ever put out anything like "Rizzo Wrap" or these custom-branded cereals? If so, do you see them as a fun distraction or an annoyance? Do you actually acquire them or do you just admire them from afar? Please feel free to leave your answers to in the comments section below. Oh and speaking of answers, allow me to reveal the answer to the maze found on the back of the "Zorilla Crunch" box. 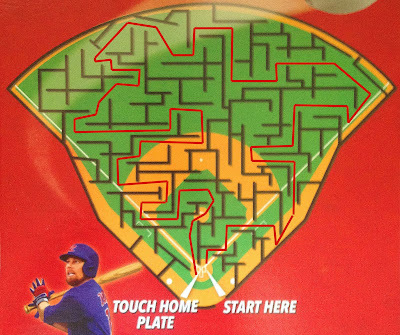 I think BenZo deviated from the base paths, just a tad bit; so, I don't think the run is going to count. Thanks for playing though! This is s great post. Love seeing such unique (and useful!) items. I expect my next card package from you to be wrapped in Rizzo wrap. Great summary of the local products in this post! I just picked up a half-dozen boxes of Rizzo Wrap from my mom-in-law who lives in the suburbs. She's so great! Two boxes for me and the rest will be given to friends in the P-town area since we don't have a Jewel-Osco. That's cool! Back in the day that end panel bio would have counted as a card, I bet. We have nothing like that locally. This just reminds me why I shop at Aldi. Cool post- always fun to see regional stuff! 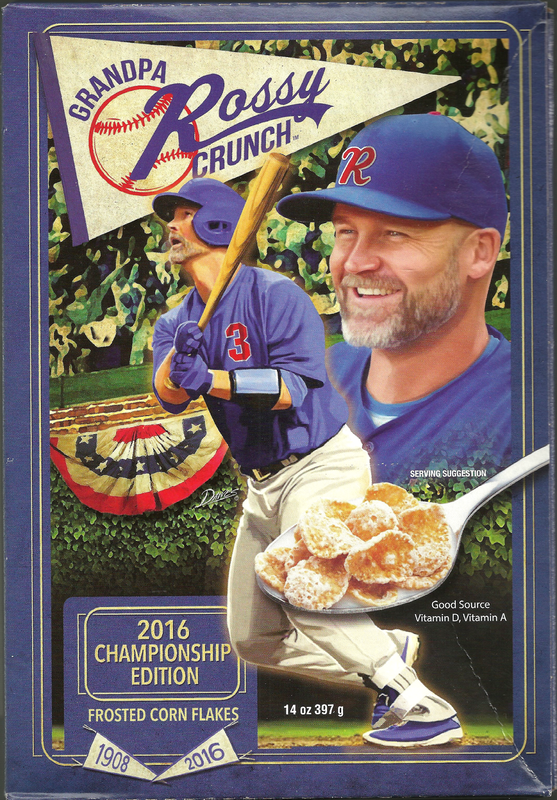 Haven't been in a cereal aisle in years, but I may have to make a special trip for some Rizzos and/or Grandpa Rossy/Zorilla Crunch one of these days.